Contents: 10 straight tracks, 2 curved tracks, 2 turnouts and instructions. The SET extension set program is a progressive system with which you can expand track layouts from the starter sets in steps. The E 8190 or E 8191 is used to expand the 81530/81535 or 81562 set. You can then systematically expand in any sequence desired with the T1 8192, T2 8193 and T3 8194 track extension sets. 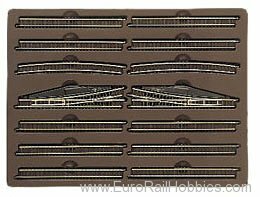 When you start off with the 81781/81785 starter sets, you already have the E 8191 track extension set integrated into the starter set, and you can then easily expand further with the T1 8192, T2 8193 and T3 8194 track extension sets. The 8198 catenary set for S+E and 8199 set for T1+T2+T3 make it easy to add working catenary operation in the SET program so that two trains can be controlled independently of each other on a track.